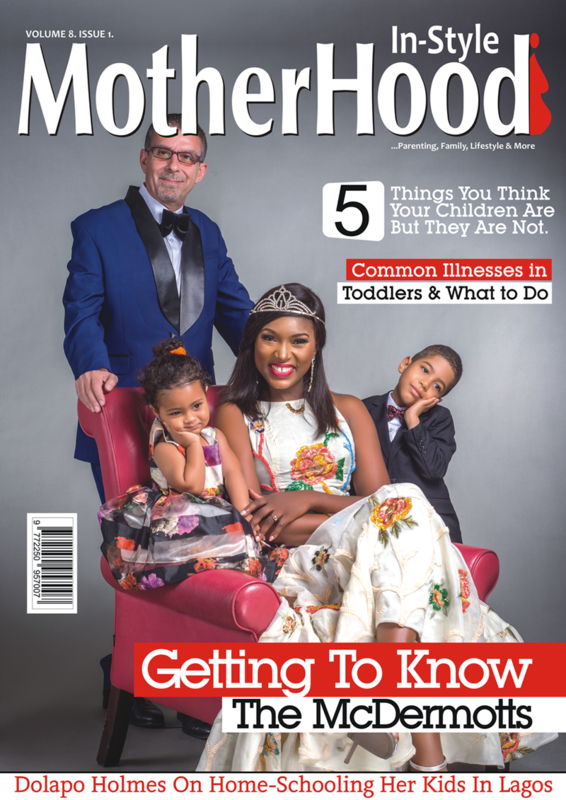 These days, many new moms- from the period of pregnancy, have postpartum body goals at the back of their minds and find it hard to accept what ‘life’ throws at them. So one can understand how inspiring it is when a new mom comes out to declare that she is down with the reality that childbearing may have altered her body shape for ever. Kaché Byrd and her husband, Anthony met while in school at North Carolina A&T in 2009. Anthony was a senior and Kaché was a sophomore, but they lived right across from each other’s dorms. The first time they met, Anthony had gone to Kaché asking to borrow a broomstick. 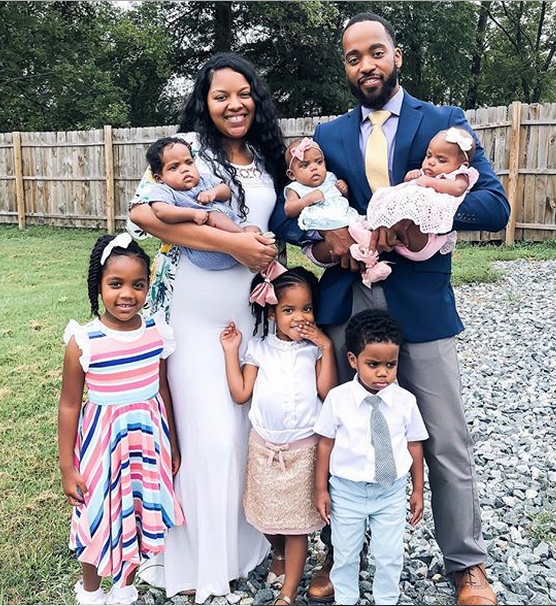 Fast-forward to 9 years later, the couple is married and have 6 beautiful children: 5-year-old Chasity London, 3-year-old Caris Jayde, 1-year-old Kasen Anthony and a set of triplets that was born on May 22, 2018. 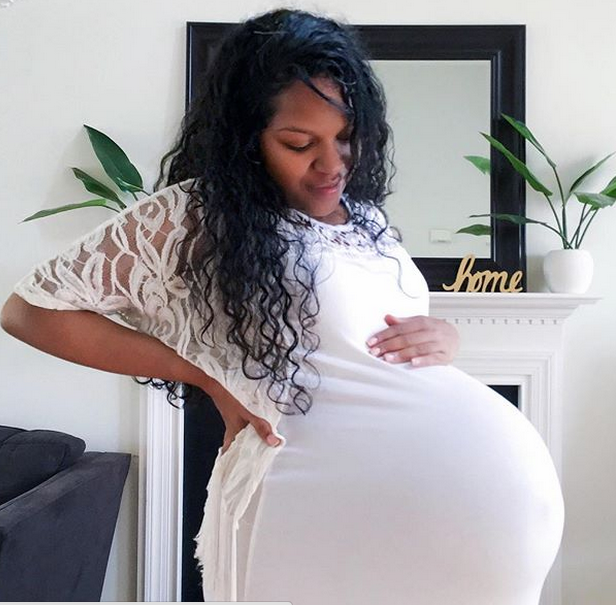 When Kaché found out that she was pregnant back in October, she had ignored the symptoms thinking it couldn’t be possible, but decided to take a pregnancy test when the symptoms persisted. An ultrasound in December revealed the family was expecting another set of girls and a boy. “How it works in-utero for higher-order multiples is the oldest baby will be a girl, the middle baby will be also a girl and the youngest baby will be a boy,” the mother said. 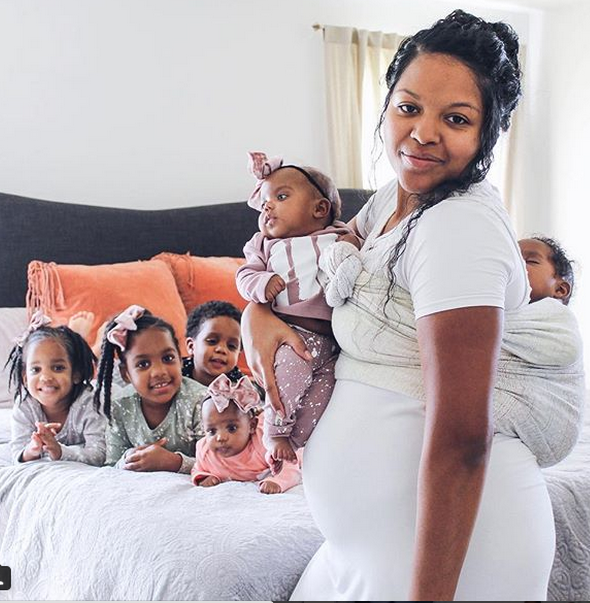 As a stay at home mom, Kaché decided to document her journey in motherhood and since she welcomed her triplets, she’s been delivering honest messages about her postpartum journey via Instagram. 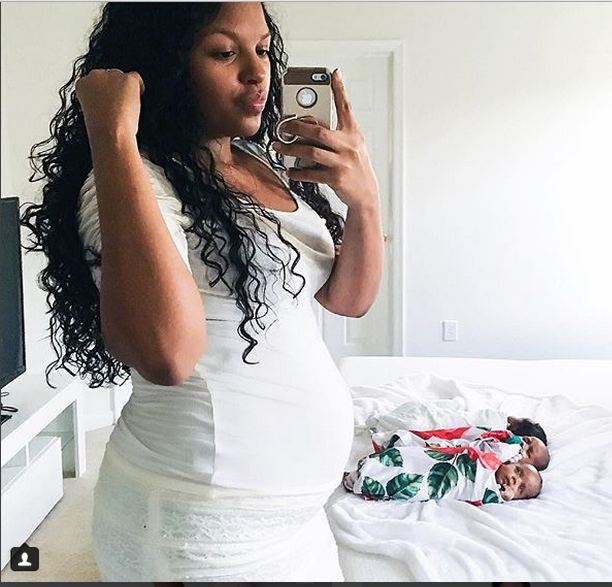 Yesterday, Kaché shared a picture of her body just 3 months after birthing her triplets and one would think she’s actually 5 months pregnant. She captioned the adorable picture with this honest post. 5 years. 6 babies. 97+ hours of labors. 1 Land Birth. 2 Water births. 1 Scheduled Cesarean Section • This is ME, currently 3 months Postpartum, not 5 months pregnant… Everyday reminding myself of the blessings that have been bestowed upon me… everyday reminding myself that I’ve made so much progress from where I was May 22nd. You see, after my cesarean section, the nurses asked me to stand and I couldn’t. I will NEVER forget the look on their faces. Three times they asked, three times I tried, three times I gave it my all… with a shaking of my head “No” I could not stand. I could not breathe. I could not talk. & Each time they sat me back down. I was defeated. I wanted to so badly recover. My quiver was full and yet I couldn’t physically care for it. If I’ve never learned anything in three months I’ve learned to have GRACE… for myself and my body! I’ve learned to embrace this fragile phase for what it is despite how it’s often depicted. It hasn’t been easy and I still battle with limitations of diastasis recti and my physical appearance, but I’m so fulfilled knowing that I embraced the past few months with prayer + patience, while the intimacy of my support system has grown immensely! ”ME • 7 weeks Postpartum . +35 lbs . While I’m not looking for a quick snap-back because that is not my norm! I carry weight after having my babies due to breastfeeding and have managed to lose every bit of it through working out. Yet, here I am in the mirror everyday staring at a postpartum body that is completely foreign to me! This loose skin, these beautiful marks that tell a story… aren’t bothersome, I see way past that. Kaché disclosed that her birth experience was an amazing one. 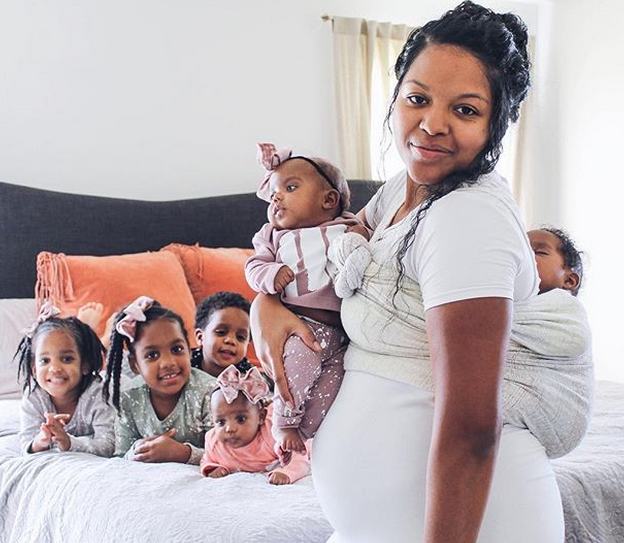 ”May 22, twenty18 ♥️ The day I birthed my beautiful babies via a ‘gentle’ Cesarean Section! 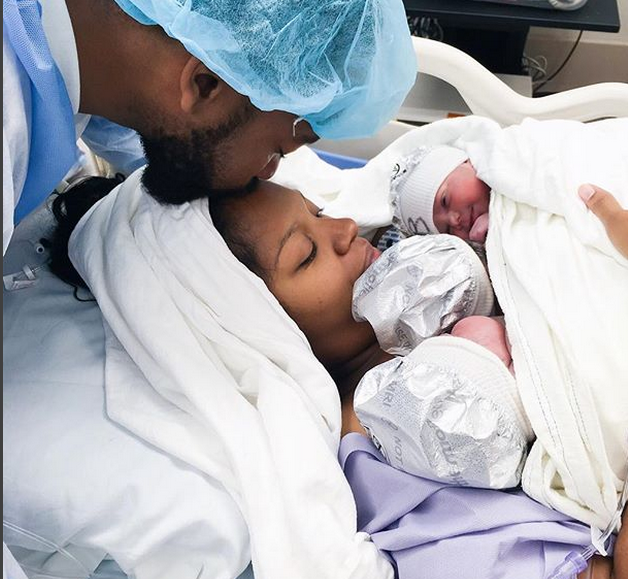 I cannot begin to explain how amazing my birth experience was… I watched each baby being born, seen their sweet face as they took their first breath and let out their first cry while the overflow of oxytocin filled my heart. I never could have imagined having a team of about 20 people so full of life and excitement, handling their duties with grace. Here we are as Proud Parents, arms full, heart filled, ready to nurture our babies into the world! • #this_is_postpartum . 5 years. 6 babies. 97+ hours of labors. 1 Land Birth. 2 Waterbirths. 1 Scheduled Cesarean Section • This is ME, currently 3 months Postpartum, not 5 months pregnant… Everyday reminding myself of the blessings that have been bestowed upon me… everyday reminding myself that I’ve made so much progress from where I was May 22nd. You see, after my cesarean section, the nurses asked me to stand and I couldn’t. I will NEVER forget the look on their faces. Three times they asked, three times I tried, three times I gave it my all… with a shaking of my head “No” I could not stand. I could not breathe. I could not talk. & Each time they sat me back down. I was defeated. I wanted to so badly recover. My quiver was full and yet I couldn’t physically care for it. If I’ve never learned anything in three months I’ve learned to have GRACE… for myself and my body! I’ve learned to embrace this fragile phase for what it is despite how it’s often depicted. It hasn’t been easy and I still battle with limitations of diastasis recti and my physical appearance, but I’m so fulfilled knowing that I embraced the past few months with prayer + patience, while the intimacy of my support system has grown immensely! — As Mothers, we’re way too hard on ourselves, we want our bodies to appear as they did before and we too often forget what we’ve done, how far we’ve come and all that we’ve accomplished. Stand, look at your reflection and give yourself GRACE! ✨ — thank you @meg.boggs for including me in this beautiful movement! How Mom, Hannah Wilkinson Discovered & Got Her Postpartum Mental Health Under Control Is A Must Read!